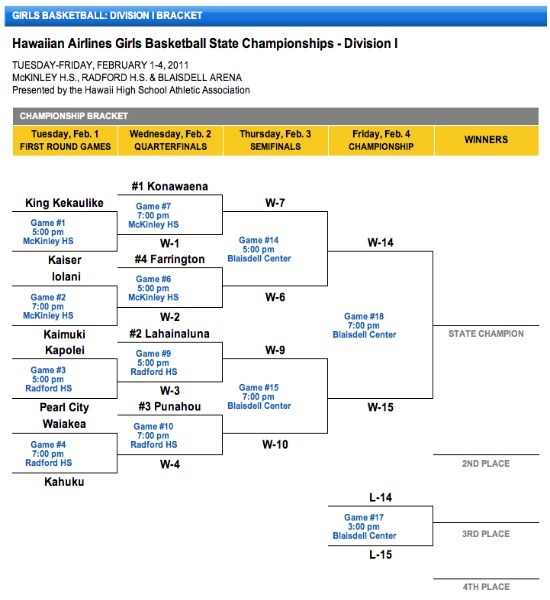 The Konawaena girls basketball team is seeded No. 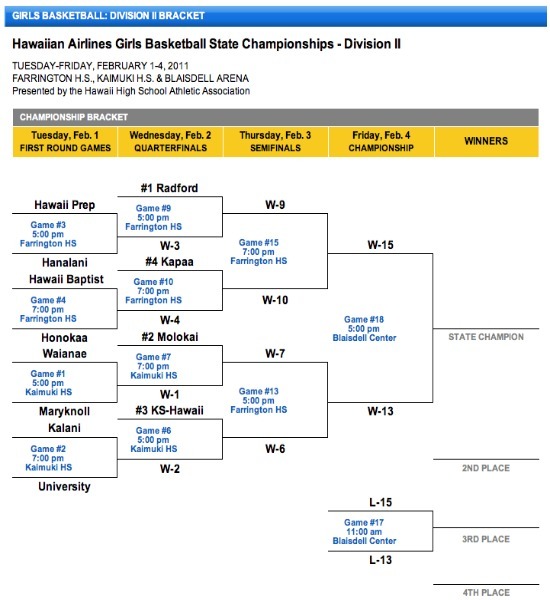 1 for this year’s state basketball tournament, which starts Thursday, Feb. 1 on Oahu. Konawaena won the title in 2007 and 2009, but last year lost a heartbreaker to Lahainaluna, which is seeded No. 2. Unseeded Big Isle teams in Division I is Waiakea. In Division II, Kamehameha Schools Hawaii is seeded No. 3, while HPA and Honokaa are unseeded. The 34-year history of the HHSAA Girls’ State Basketball Tournament began in May 1977, when eight teams gathered at Mid-Pacific Institute. All three ILH schools scored first night wins, including #7 seed Punahou, which defeated second seed and OIA champion Kalaheo. Opening night proved to be a sign of things to come as ILH teams won the tournament in the first six years, during which time there were five all-ILH finals. Two well-known college coaches took part in the first title game. Former Hawaii Pacific University men’s basketball coach Russell Dung guided Maryknoll to a win over Punahou, which was led by University of Hawaii volleyball coach Dave Shoji, for the first of the Spartans’ back-to-back championships. The eight-team format continued for the next six years, through 1983. Starting in 1979, Punahou coached by Robin Durand, captured three consecutive state titles, each time beating University High in the final game. The Junior Bows finally turned the tide in 1982, by edging the Buffanblu in the title match. In 1983, Kahuku, coached by the late Harry Kahuanui, won the OIA’s only championship prior to 2001, defeating University in the finale. ILH teams won all 14 of their first round games and conversely, neighbor island teams lost all 27 of their openers. In 1981, Kohala’s Lynette Liu set a still-standing 3-game record with 85 points, despite the fact that the three point shot did not become part of the rules until 1985. The only double and triple overtime games prior to 2003 took place. Both times Waiakea was the victim. In 1980’s first round, Leilehua beat the Warriors 70-69 in two OT’s and in 1983’s Consolation Final, Lahainaluna defeated the Big Island team 61-54 in three OT’s. In 1984, the tournament – won by University – changed to a twelve-team format, with the champions of the OIA, ILH, BIIF and MIL (except in 1988, 1993 and 1994 when the KIF winner replaced the MIL winner) being seeded and earning first round byes. Waiakea gained some measure of revenge for its double and triple overtime losses by winning back-to-back championships in 1985 and 1986 – the only neighbor island team to win prior to 2004. After Iolani won its first of four titles in 1987, Kamehameha, coached by Al Apo, became a dominant force in the years 1988-1993, winning five of the six years (including four in a row), twice as an unseeded team, and finishing second once (to Iolani). A highlight of these years came in 1990 when Iolani’s Melanie Azama scored a 4-game record 122 points. The ILH continued to dominate as the century came to an end. From 1994 to 2000, Punahou won three times, while Kamehameha and Iolani each won twice. Four of those years had an all-ILH final. The 12-team format was intended to be permanent, but a state-wide public school teachers’ strike in 2001 forced HHSAA officials to scramble just to save the tournament. The 2001 event was an eight-team affair with no consolation rounds and took place for the first time at three sites. Quarterfinals were held at McKinley and Kamehameha, while the semis and finals were at the Stan Sheriff Center. It also marked the first all-OIA final, in which unseeded Aiea upset Kalaheo, a team it had lost to one week earlier in the OIA title game. The twelve-team format returned in 2002 and Kamehameha won for the eighth time. The Warriors’ Clay Cockett joined Durand, Iolani’s Bernie Ching and Punahou’s Shelley Kahuanui-Fey as three-time winners. Also in 2002, Lahainaluna’s Fatai Halaapiapi had the tournament’s only recorded triple double (10 points, 17 rebounds and 11 blocks). The seven tournaments from 2003 and 2009 were dominated by two teams, Punahou and Konawaena. The Buffanblu, coached by Mike Taylor won four times (03,05,06, 08) and Bobbie Awa’s Wildcats won three(04,07,09). 2003 — Konawaena’s Nancy Hoist made 20 of 20 free throws over three games. 2004 — The inaugural Division II tournament was held with four teams. 2005 — In the first double overtime championship game, Punahou defeated Konawaena. Kamehameha-Hawaii won the Division II title without having a senior on the roster. 2006 — Punahou’s Shawna-Lei Kuehu scored a record 37 points to lead her team to a 61-38 win over Roosevelt, the second most lopsided title game (In 1978,Maryknoll beat Kalaheo 61-29). The Division II tournament expanded to 12 teams. 2007 —Unseeded Kamehameha-Hawaii defeated top-seeded Sacred Hearts in the Division II final. 2008 — The tournament was played in February for the first time. Punahou won its 10th championship, the fourth for coach Mike Taylor. In Division II, unseeded Campbell beat top-seeded McKinley in the second all-OIA final. 2009 — In a sequel to 2005, the same two teams went to double overtime in the title game, with a different outcome, Konawaena prevailing over Punahou. Molokai won Division II, its first state basketball title and the first for the Maui Interscholastic League. 2010 — A pair of defending champions reach the title games, only to lose to a pair of first-time winners. In the first all-neighbor island Division I final, Lahainaluna rallied from an 11-point deficit late in the third quarter to defeat Konawaena. In Division II, Kaimuki, with two of coach Mona Fa‘asoa’s daughters playing key roles, beat Molokai. In all, 53 different schools have taken part in the 41 tournaments (34 years plus the last seven years of Division II). Top-seeded teams have won 19 times, unseeded teams 5 times. Aside from winning the most tournaments (10), Punahou ranks first in most tournaments played (24), most games played (76, including consolation), and most victories (61, including consolation). The Buffanblu are 53-14(.791) in championship round games and 8-1(.889) in consolation rounds. 1984 – tournament expanded from 8 to 12 teams. 2006 – division II tournament expanded to 12 teams.